Let’s talk about those Collectibles for a second. Here is our awesome loot picture. Here are some of the things that you will be able to pick up in Rise of Azshara. On the left hand side here you see… not much else to say here, it is awesome, it is a giant wheel. It is a giant wheel mount. It’s very exciting; and next to that, one of the Battle Pets you will pick up at Mechagon, this tiny little mechanical gnomebot. He has a variety of different heads, including one that is a siren. So this is essentially Mechagon’s Alarm-o-bot. We brought it back, again. Always have to have an Alarm-o-bot. It is a very “gnome” thing. 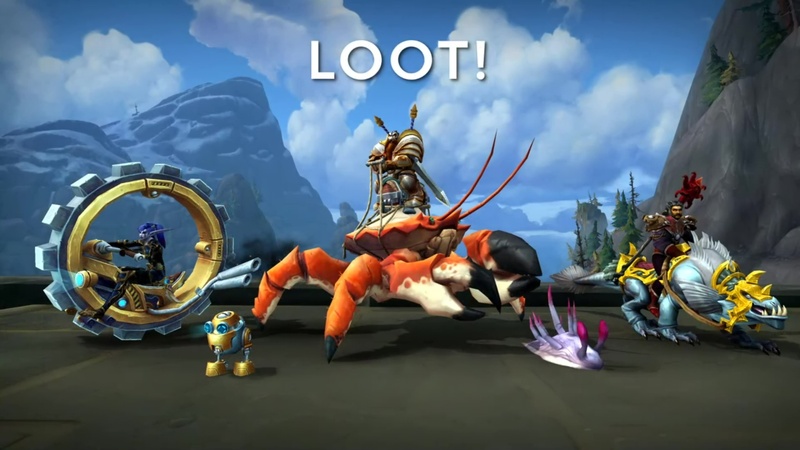 The crab mount (that we mentioned at BlizzCon) has gotten finalized, and all its final animations — and man, it looks amazing! Down in the deepest areas of Nazjatar, of course, there are some creepy undersea creatures to collect for the Pet Battles; and if you were a fan of Warcraft III, you may have been wondering this entire time what happened to those remaining naga units: the Tidal Guardian and the Snapdragon. Well, I am happy to announce that you will be able to see them using Tidal Guardians down in Nazjatar. These giant snake creatures shoot lightning, and will be tameable by Hunter players; and the Snapdragons will also be showing up (shown here on the right-hand side as an obtainable mount) in Nazjatar.